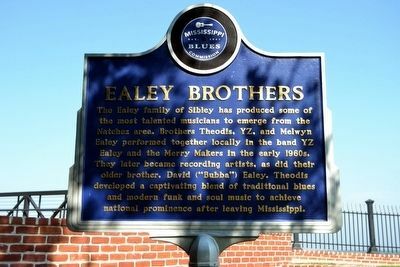 The Ealey family of Sibley has produced some of the most talented musicians to emerge from the Natchez area. Brothers Theodis, YZ, and Melwyn Ealey performed together locally in the band YZ Ealey and the Merry Makers in the early 1960s. They later became recording artists, as did their older brother, David (“Bubba”) Ealey. Theodis developed a captivating blend of traditional blues and modern funk and soul music to achieve national prominence after leaving Mississippi. brother (“Bubba”) (b. 1927), who began playing guitar locally in his teens and soon moved to New Orleans, where he played at house parties in a style similar to Lightnin’ Hopkins and Little Son Jackson together with a young Guitar Slim. He lived for many years in Oakland and later retired to Port Hudson, Louisiana, all the time continuing to perform informally. YZ received his first guitar from Bubba and began performing at local juke joints with Melwin as a teenager. After a stint in the Navy, YZ settled in Oakland, where he performed with L.C. “Good Rockin’” Robinson, Big Mama Thornton, and others. 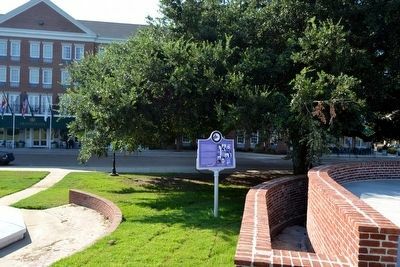 After several years he returned to Natchez, where he formed the Merry Makers with his younger brothers and local musicians including Tobe Smith, Jonathan Grennell, and A.J. Reed. For several years they served as the house band at Haney’s Big House in nearby Ferriday, the most important club in the region from the late ‘40s until mid-‘60s. YZ continued to work locally for decades, later employing the band of Harvey Knox, born in Tallulah, and vocalist Al Watson, a native of Vidalia. Marker series. 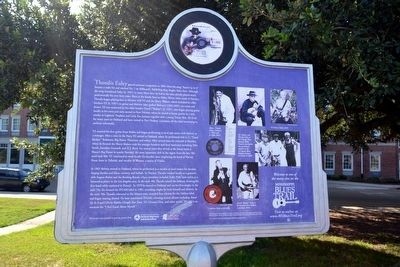 This marker is included in the Mississippi Blues Trail marker series. Location. 31° 33.756′ N, 91° 24.36′ W. Marker is in Natchez, Mississippi, in Adams County. Marker can be reached from N. Broadway Street north of Main Street, on the right when traveling south. Touch for map. Marker is located in Bluff Park next to the fountain. Marker is in this post office area: Natchez MS 39120, United States of America. Touch for directions. 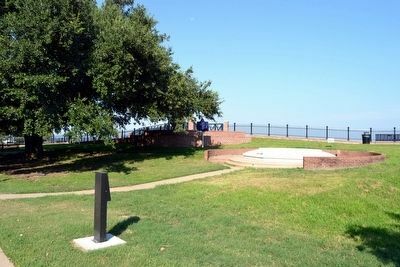 (within shouting distance of this marker); Bluff Park and North Broadway Street (within shouting distance of this marker); Spanish Colonial Natchez (about 300 feet away, measured in a direct line); Bluff Park - Playground for the City (about 300 feet away); Natchez (about 400 feet away); Richard N. Wright (about 400 feet away); Bluff Park - Memorials and Louisiana Connections (about 500 feet away). 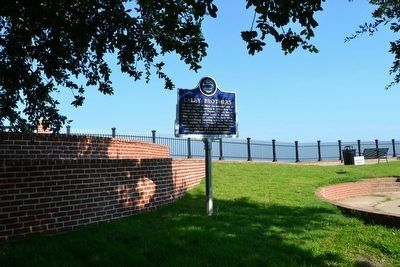 Touch for a list and map of all markers in Natchez. More. Search the internet for Ealey Brothers. Credits. This page was last revised on August 30, 2017. This page originally submitted on August 14, 2015, by Duane Hall of Abilene, Texas. This page has been viewed 342 times since then and 6 times this year. Photos: 1, 2, 3, 4, 5. submitted on August 14, 2015, by Duane Hall of Abilene, Texas.